Several months ago for the Daring Bakers, I made Dorie Greenspan’s Perfect Party Cake. Most of the group members, including myself, had very positive things to say about this cake. However, many of us, again including myself, found that the cake didn’t rise much. Granted, the copy of the recipe I used had a typo in it regarding the amount of flour, but that wasn’t the case with everyone who had problems. 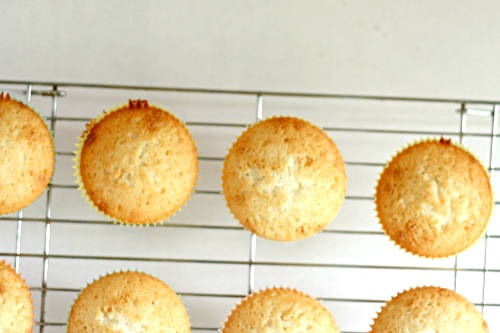 So a few weeks ago when I made white cupcakes, I used a different recipe, by Nick Malgieri. The recipe calls for 2 cups all-purpose flour, but I was pretty sure I’d like it better with cake flour, so I used 2¼ cups cake flour instead. The cupcakes were definitely good, but just the slightest bit dry. Now I was on a mission. Is it just a characteristic of white cake that it’s dry? Would Dorie’s recipe be perfect if I used the correct amount of flour, or would Nick’s be better if I followed it exactly? And why not throw a third recipe into the mix, and try one from my old favorite, Cooks Illustrated? I pared the recipes down so that they each used 2 eggs, and I made cupcakes. I made them all in one afternoon, leaving the oven on between batches and not adjusting the dial, to make sure oven temperature wasn’t a factor in any differences. I left out any flavorings besides vanilla, used the same amount of vanilla in each, and used whole milk in all three recipes. You can see that the three look very different. Left to right, the photos show Dorie’s, Nick’s, and CI’s. Nick’s looks drastically different, which I can attest is due to the all-purpose flour. 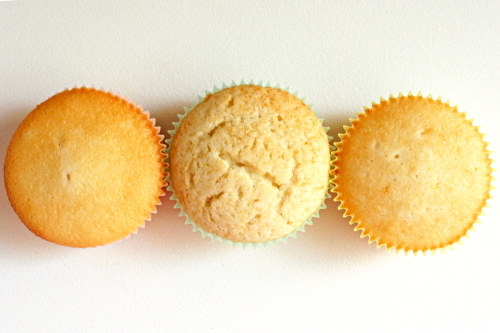 The photo below shows the result of Nick’s recipe when made with cake flour. It more closely resembles the other two. The difference in taste and texture mirrors the difference in looks. Nick’s cupcakes are far drier than Dorie’s and CI’s. You can see that their texture looks more muffin-like with a coarser crumb. Dorie and CI’s are more similar. They’re both fluffy and light with a nice resiliency. Dorie’s cupcakes rose nicely, in contrast to when I made the layer cake in March. At first, Dave and I agreed that CI’s beat out Dorie’s by a hair. They seemed moister and more flavorful. But later on, I did a comparison of just those two, unfrosted, and I was able to spot some subtle differences. CI’s cupcakes are undeniably moister. They are also sweeter. Dorie’s cupcakes aren’t as sweet, but I do like their flavor. 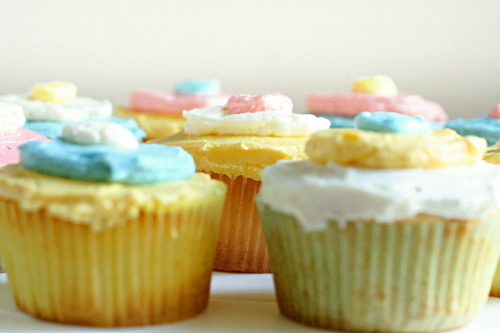 Without the sweetness, some of the other flavors in the cupcake are noticeable. The question then arises – what causes these differences? I’ve laid out the points of the recipe that I think would have the most significant impact on the outcome. I’ve entered Malgieri’s recipe as using 9 ounces (2¼ cups) cake flour instead of 10 ounces (2 cups) flour, since it seems pretty clear that all-purpose flour in a cake as light as white cake is a bad idea. I’m guessing Malgieri’s cupcakes are drier because they use less milk. Obviously CI’s are sweeter because they have more sugar. Dorie’s and CI’s recipes, which produced similar results, are actually pretty different. Dorie’s uses less butter and sugar, which I’m assuming is balanced by more milk and less egg whites so the cupcakes aren’t dry. I think the coarser, more muffin-like texture of Malgieri’s cupcakes might arise from the lack of a final beating step after all the ingredients are added. I wonder if I can tweak the recipes to get my favorite aspects of each. It’s not as simple as just reducing the sugar in CI’s recipe, because sugar contributes moistness. But maybe I should reduce the sugar by 2 tablespoons and increase the milk by 2 tablespoons. It’s worth trying, but to be honest, after this experiment, I think it’s going to be a while before I feel the urge to make white cake again! CI note: If you have forgotten to bring the milk and egg white mixture to room temperature, set the bottom of the glass measure containing it in a sink of hot water and stir until the mixture feels cool rather than cold, around 65 degrees. Cake layers can be wrapped and stored for one day. 1. For the Cake: Set oven rack in middle position. (If oven is too small to cook both layers on a single rack, set racks in upper-middle and lower-middle positions.) Heat oven to 350 degrees. Spray two 9-inch round cake pans with nonstick cooking spray; line the bottoms with parchment or waxed paper rounds. Spray the paper rounds, dust the pans with flour, and invert pans and rap sharply to remove excess flour. 2. Pour milk, egg whites, and extracts into 2-cup glass measure, and mix with fork until blended. 3. Mix cake flour, sugar, baking powder, and salt in bowl of electric mixer at slow speed. Add butter; continue beating at slow speed until mixture resembles moist crumbs, with no powdery streaks remaining. 4. Add all but ½ cup of milk mixture to crumbs and beat at medium speed (or high speed if using handheld mixer) for 1½ minutes. Add remaining ½ cup of milk mixture and beat 30 seconds more. Stop mixer and scrape sides of bowl. Return mixer to medium (or high) speed and beat 20 seconds longer. 5. Divide batter evenly between two prepared cake pans; using rubber spatula, spread batter to pan walls and smooth tops. Arrange pans at least 3 inches from the oven walls and 3 inches apart. (If oven is small, place pans on separate racks in staggered fashion to allow for air circulation.) Bake until thin skewer or toothpick inserted in the center comes out clean, 23 to 25 minutes. 6. Let cakes rest in pans for 3 minutes. Loosen from sides of pans with a knife, if necessary, and invert onto wire racks. Reinvert onto additional wire racks. Let cool completely, about 1½ hours. Dorie Greenspan’s Perfect Party Cake recipe can be found here. Set a rack at the middle level of the oven and preheat to 350 degrees. In a large mixing bowl, beat butter and sugar for about 5 minutes, until light and fluffy. Stir together flour, baking powder and salt. Set aside. Combine egg whites, milk and vanilla extract. Add ⅓ of the flour mixture to butter mixture then add half the milk mixture. Continue to alternate beginning and ending with flour mixture. Scrape bowl and beater often. Pour batter into prepared pan(s) and smooth top with a metal spatula. Bake cake(s) about 25 to 30 minutes, or until a toothpick inserted in the center emerges clean. Cool in pan on a rack for 5 minutes, then turn out onto a rack, remove paper and let cool completely. 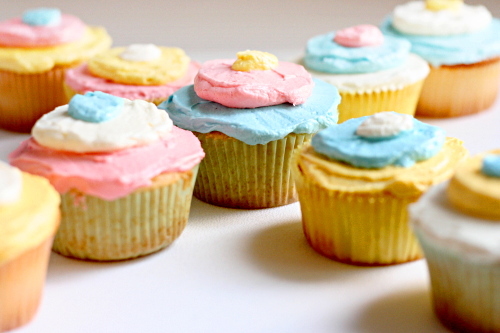 *To make cupcakes from any of these recipes, line a standard-sized muffin pan with baking-cup liners. 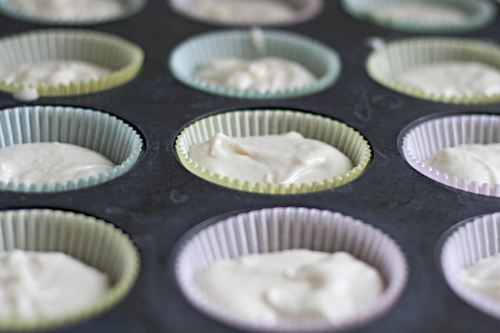 Fill cups just over ½ full with batter. Bake at 350 degrees for 18-21 minutes. It’s been a long while since I’ve made white cake, but the one I made more than a year ago rose really well (Flo Braker’s). The amounts are 8.6, 10.3, 1, 16, 5, and 2-1/2 (based on your table above), and the last step is folding in 3 of the 5 egg whites as a stiff meringue. It’s really sweet, though. I’ve tried making CI’s but it wasn’t a riser for me too (plus the technique is not friendly to those with a hand mixer, sans paddle). 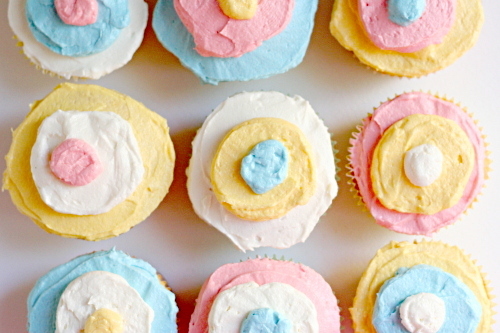 Regardless of these differences, the cupcakes all look very cute– it looks like Dorie’s was the best riser this time! That was such an interesting post to read. I love comparing different recipes and seeing how there are so many different versions. I hope that you find the perfect white cake. 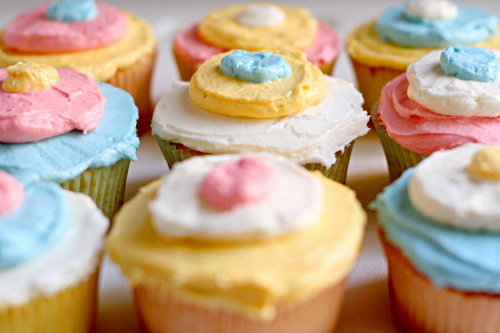 Your cupcakes look so pretty- I love the way you decorated them. Thank you so much for posting this!! I have been wanting to make a white cake and have been pouring over recipes trying to figure out which to use. I love this post, great work!! Thank you for this. I know that you recommended the CI recipe to me the other day, but now it’s good to see why. Great post – I know I’ll come back to it again for reference. Your experiment was not only helpful but extremely interesting. Such a great analysis and execution of your experiment, especially since you laid it out so clearly. great examination, they look SO TASTY. The frosting has my mouth watering. What a great project to take on. I’m looking for the perfect cake recipe for my DS’s birthday cake and this gave me a great starting point and lots of helpful hints. What an interesting experiment! Great job comparing the recipes! I absolutely loved your review. I’m always on the quest to finding the cake that most resembles the fluffiness of cake mix. By the way, I’ve tried both CI and Dories, but never both at the same time.. with not that many people to feed it too, I’ll end up eating the whole thing! I think CI’s is moister, slightly fluffier, but too sweet. I like how Dorie’s uses less butter. Overall, I’ve had more sucess with Dorie’s because it is tender, yet sturdy enought to cut. I love that you did this experiment! I’m clipping this post and want to return to it when I can try it out too! I love white cake, but have yet to find my favorite. Thanks for a wonderful post! This is the most helpful website I’ve seen to help me decide on what recipe to try. I tried the CI recipe for cupcakes today and it turned out really well. I have a hand mixer and I thought it was easy. I thought it was a little bit sweet too, but the texture was exactly what I was hoping for! I am going to use this for my son’s birthday cake! Thank you for posting this, it was very helpful and a great read! Really enjoyed your post. Good work on comparing the recipes. I’ve been and still am in the lookout for a good white cake. I tried the CI’s cake and although it tastes aweseome and is tender, I found it to be a tad dry (could be my handheld mixer) . And its not easy to split into layers….so tender that it crumbles away. I wonder how they make the white cakes that you get at the bakeries…light, fluffy and so moist !!! What an informative read!!! Thank you for making the comparisons… there are so many different varieties of white cake it’s hard to deduce where the similarities begin and the differences end! I’ve yet to ever make a white cake (GASP) and I’ve been on the look out for some tips and tricks, so this write up on your research is great! I’ve had both Dorie’s and Nick’s recipes on my list, but now I’ll definitely add CI’s too! Thanks for sharing! Just wanted to say a huge THANK YOU for this great, thorough comparison! I’m in the market for the perfect white cake, and you’ve given me great ideas!! You know I really really enjoy reading your post! Always….I think I and probably at least a few others learn so much about recipes/ techniques/ ingredients just by reading your posts! I absolutely am thankful that you actually took the time to do recipes comparison! I don’t think not many ppl. out there could find the time nor the energy to do what you do! So please, for the sake of many others out there, please keep up the good work! You definitely have a very dedicated fan out there who enjoys your posts, a lot! I’m so excited that I found this post!! I’ve always been on the lookout for the perfect white cake recipe. I have made sooo many white cakes and have been mostly disappointed by them. Last year I did make the “Perfect Party Cake” by DG and I liked it a lot but I tend to lean more towards sweeter so I’m thinking the CI one will be more to my liking. I have every Cook’s Illustrated magazine and cookbook there is so I’m not sure why I’ve never attempted their white cake recipe but I’m going to today……if I find the time that is. That you so much for taking all that time to compare and bake all that cake! I know it’s fun but it’s still time consuming. Your red velvet comparison is also really interesting. thanks a lot for doing the hard work for all of us. I tried CI’s version of white cake and liked it. Could you please suggest me if I can double or triple the ingredients for a 9 X 13 2-layer cake. Rams – I’m glad you liked it! You’d want to double the ingredients for a 2-layer 9×13-inch cake.